Get your students out of their seats and quizzing each other! 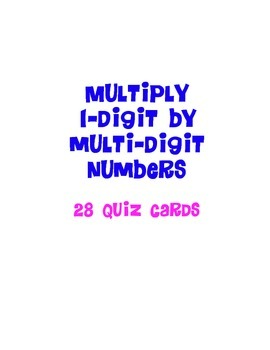 These 28 quiz cards let your students practice solving 1-digit by multi-digit multiplication problems. For example: 3 x 30; 3 x 300; 3 x 3,000; 3 x 478; etc. 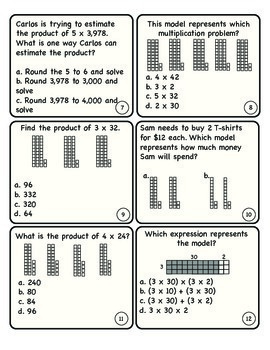 The multiplication problems on these cards are shown as equations, models using base-ten blocks, and arrays to illustrate partial products and the Distributive Property. 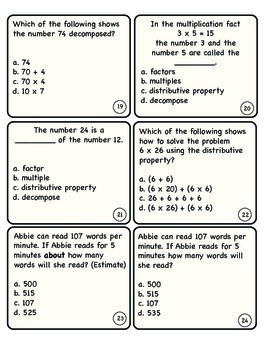 These cards test your students knowledge of vocabulary words such as: multiple, factor, Distributive Property, decompose, estimate, and product. The answer sheet is included. 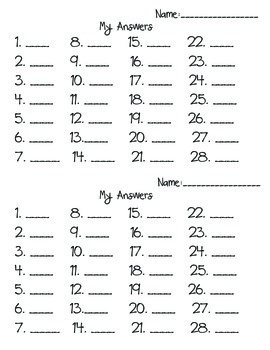 I've also included a half-sheet that students can use to record their answers on. These cards can be used in many ways. My favorite way to use them is as a quiz-quiz trade activity with the entire class, but they could also be used as a center for small groups.